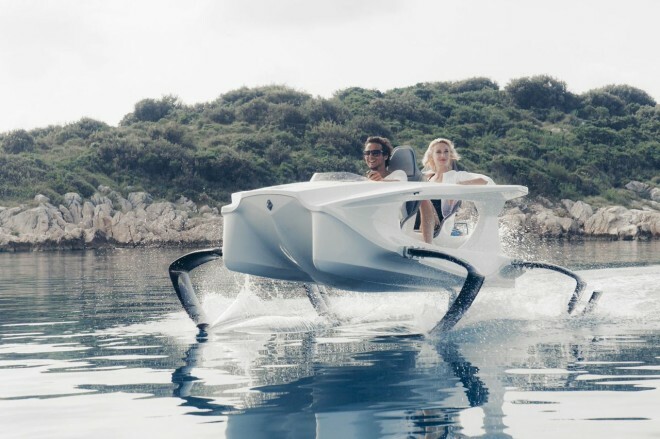 Pretty cool new concept boat that could be a lot of fun, and certainly attract a lot of attention. There’s an embarrassing gap in your electric commute. You go from your bed to the bathroom on RocketSkates. You ride a Boosted skateboard to your parking garage, where you get in your Tesla for the drive to the ferry terminal. Unless you live in Denmark, that ferry is likely a diesel-powered craft—and you often feel perturbed about that during the electric-unicycle ride from the boat terminal to your office. As an added benefit, it sort of looks like the aquatic version of the speeder bikes in Return of the Jedi. Once it gets going, its four aluminum hydrofoils create enough lift to raise the 9.8-foot, 220-pound vessel out of the water. If its battery conks out while you’re on the water, rest assured that the Quadrofoil comes with a couple of life jackets, a collapsible paddle, and a safety whistle. While the Quadrofoil can be used for seafaring journeys, it’s probably not a good idea to take it king crab fishing off the coast of Alaska. It’s designed for use in bodies of water that are at least 3.3 feet deep with maximum wave swells of 1.6 feet, so lakes, ponds, rivers, large swimming pools, and that damn puddle on the corner of 39th and 8th are a better fit. A limited run of 100 boats is planned to ship in March of next year, but they’re available for preorder now. A step-down model, the Q2A Electric, has a top speed of 18mph and a battery range of 31 miles, and it’s due in mid-2015 for $18,500. That'll look great behind the Rav!! Last edited by Garett; 11-25-2014 at 11:35 AM. I can't for the life of me see how the math works out on that for power/range/speed, unless goofy shaped hydrofoils really are the most efficient way to travel. Is she showing her breasts in this pic?? Thank god it comes with a safety whistle. That'd be a deal killer for me. I'm calling BS on the speed and range !!! View Next Unread Anybody had Corrosion-X affect mono?